One of the chief advantages of Invisalign in Fresno is how easy it is to start treatment. Modern techniques and technology make the process easier than ever before. By setting an appointment with your dentist today, you could be enjoying a new and enhanced smile in as little as a few months. Your journey to a better smile begins with a visit to your Fresno dentist. He or she will perform a complete oral exam to determine the best type of alignment therapy for you. Should you agreed to proceed with Invisalign, the next step is to perform a digital scan of your teeth and gums. This step requires no messy molds or other old-fashioned approaches. A simple handheld device will allow your dentist to obtain all the information needed to craft your customized aligners. Invisalign software will examine your teeth’s current condition using data gathered from more than 6 million Invisalign patients. This step only takes a few minutes. Once it’s finished, you’ll be able to see exactly what your new smile will look like. 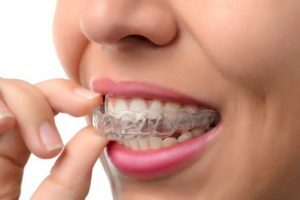 One of the most common objections to traditional braces is that they feel uncomfortable. Invisalign aligners avoid this problem by providing the benefits of alignment therapy gently and comfortably. Traditional braces are at all-or-nothing proposition. Once in place, they can only be removed by a dentist. This makes eating, brushing, and flossing difficult. Compare this to Invisalign aligners, which the wearer can remove for up to two hours per day. With Invisalign, most patients achieve their treatment objectives within about 12 months, often sooner. Maintaining those benefits for the rest of their lives is easy. Simply wear a nightly retainer. Misaligned teeth are difficult to care for. Essential tasks like brushing and flossing may not remove enough plaque to prevent tooth decay and gum disease. Even a professional dental cleaning can be less effective when your teeth are out of place. Your dental health effects your overall health. Tooth misalignment issues can contribute to migraine headaches, back or neck pain, and discomfort throughout your body. The only way to correct these conditions is to treat the source. Dental problems can impact your social and professional life. Misaligned teeth are a common source of social awkwardness and self-esteem issues. The look you project to the world affects not only how you see yourself but how others see you as well. Make an appointment with your Fresno dentist soon to learn more about Invisalign and other treatment options. The time you invest will more than pay for itself with healthier teeth and a happier life. Dr. Byron Reintjes is both a skilled general dentist and an expert on Invisalign treatment. Dr. Reintjes has been treating patients here in Fresno for almost 30 years. You can reach his office online or by calling (559) 438-6684.